One of Hungary’s national political weekly magazines, Figyelő, was bought by Prime Minister Viktor Orbán’s former adviser and government historian Mária Schmidt on Monday. While Ms. Schmidt promises to keep publishing the weekly, it is all but certain that the publication’s critical, independent voice will be gone. Figyelő will almost certainly follow the fate of the online publication Origo, or TV 2, both of which transformed into staunchly pro-Orbán and pro-Fidesz publication, after they were bought up by business interests close to the government. As our readers will recall: the most severe blow to the independent press in Hungary was the politically-motivated shuttering of the country’s largest national print daily, Népszabadság. Our Canadian and American readers might find it odd that a civil servant, such as Ms. Schmidt, is able to purchase outright one of the main national publications in the country. In Hungary, however, even the mayors of the smallest rural towns (such as Lőrinc Mészáros, mayor of Prime Minister Orbán’s home town) can become one of the wealthiest, most influential businesspeople and media magnates in a few short years. Figyelő is published by a company called Médiacity Kft. The political weekly’s readership is estimated at being between 7,000 to 8,000, although the newest circulation figures are not available. Ms. Schmidt served as the Government Commissioner of the Memorial Year of the 1956 Revolution in 2016. Since 2002 she is also the Director of the House of Terror Museum in Budapest. During the sixtieth anniversary commemorations of 1956, Ms. Schmidt faced significant controversy and derision, after a government-commissioned pop song written for the anniversary by Desmond Child turned out to be a recycled piece of music already used in the past for basketball players in Miami. Ms. Schmidt spent US$ 183,000 in public funds on the recycled song. Worse still was the embarrassment caused by a billboard produced for the anniversary celebrations, which incorrectly identified the “young fighter” depicted in the historic photograph. The late Pál Pruck appeared on the billboard, yet the caption read László Dózsa–an actor whose alleged role in the revolution has been called into question by historians. Ms. Schmidt did not believe that the photograph did, indeed, depict Mr. Pruck. Mr. Dózsa, who is still alive, refused to confirm that the caption was incorrect. 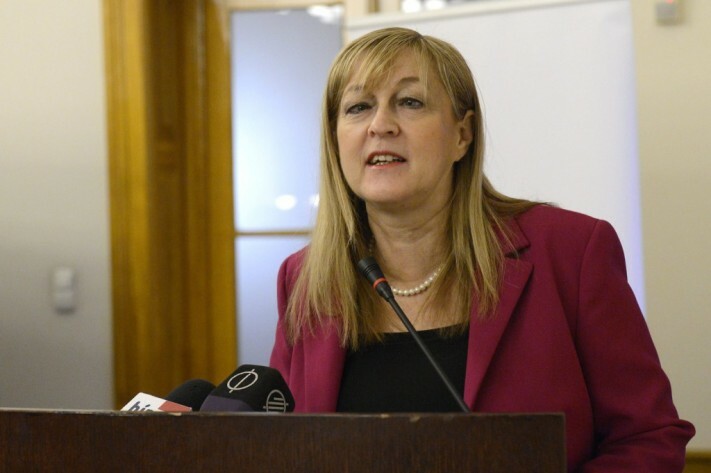 Ms. Schmidt would not listen to Mr. Pruck’s own daughter, referring instead to Mr. Dózsa as a “hero” and Mr. Pruck as a “convicted criminal,” who later went on to speak against the 1956 revolution during the Kádár era. Ms. Schmidt also called the criticism that arose from the poster a “baseless attack” against her. To be sure, Mr. Pruck’s family never claimed that he was a revolutionary hero of any sort–they simply asserted correctly that the government’s anniversary poster boy was their father, and not Mr. Dózsa. The photographer who had taken the photo, as well as historians confirmed what Mr. Pruck’s daughter was saying all long–the photograph depicted Mr. Pruck and not Mr. Dózsa. Ms. Schmidt never admitted her error, but wrote a lengthy letter to the family claiming that there is no definitive proof as to who actually appears on the photo (even though the photographer and historians agree) noting instead the heady days of the uprising were confusing and produced lots of misinformation. As for the future of Figyelő: if the fate of Origo, TV 2 or, indeed, Mediaworks is indicative of what happens to independent media when bought up by those close to the government, then we can expect Hungary to lose yet another critical voice. to the independent press in Hungary was the politically-motivated shuttering of the country’s largest national print daily, Népszabadság. That rotten-to-the-core post-commie daily? As if Der Stürmer after WW2 had been allowed to be published and appreciated as part of “independent” press. As to Figyelő – remember what Comrade D-209 said about having a supporting medium and TV after 2002? “Buy one for yourself” – that did not make your belly hurt, did it? Another hate-filled, utterly prejudiced propaganda piece in this mono-tune publication. Rather boring …. Another BS article by the Soros paid “fake” media. – The elimination of all independent medieval. – The brazen lies about keeping the qualities that be. – The arrogance of denying the truth regardless of all involved, person, photographer, historians. – And after all of the above the bloodthirsty comments. Yes, too mant fascists in Hungary. 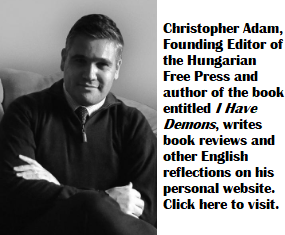 Pathetic troll responses above, to Chris Adam’s calm and level headed article about the steady erosion of media freedom in Hungary. The mechanisms of political control over the media in Hungary are easily described and verified. Any medium that is critical of the ruling party is denied access to government advertising, and any corporation that advertises in a medium that is critical of the government party is discriminated against in public tenders. Pretty soon the opposition media is on the verge of bankruptcy, because its public and private advertising revenue is shut off. At this point Orbán’s political cronies come to the rescue of the medium that ostensibly failed because of “market forces”. The Fidesz crony gives an offer to the dying medium that can’t be refused. The rescuer is almost always given an interest free loan by one of the State owned banks, then injected full of state ads, and new corporate ads, and the newly acquired medium, miraculously begins to sing like Fidesz. Magyar Hirlap, Magyar Nemzet, Népszabadság, Heti Válasz, Napi Gazdaság, TV2, Figyelő, Origo, all of the county papers follow this pattern. Hungary is a banana republic, supported by trolls like those above, and by the silence of the lambs. Orbán’s Hungary is a mafia-state, run by a common criminal. He’ll be in the White House shortly to give his newfound pal, Donald Trump some pointers on how to make crime pay, how to bring critical media to its knees. Göllner, with his usual village idiocy. This is the first and last time that I respond to your posts. If you are unable or unwilling to offer empirical evidence in your comments and if all that you aim to do here is to toss ad hominem attacks, then please comment elsewhere. Read his monomaniacal comments, comrade. That’s the evidence, which may calm down that little censor in your head. Mr Adam is a calm man. He has proven that by allowing trolls like you to run amock on these pages. I have made an assertion about the Orbán regime’s media policy above, that has been backed up by empirical evidence world wide. I named the journals in question that have been taken over and summarized the methods used. You had a chance to refute me, but instead of doing that, you are wasting your powder and everyone’s time by issuing insults and ad hominem attacks. Village idiocy ? That’s a good one. 🙂 How does it differ from urban idiocy, or just plain idiocy ? She has a right to buy whatever she wants. If she wants to buy a paper with a few thousand readers than she can buy it. It’s not that huge of a deal. It happens in the U.S as well. George Soros a huge backer of the Democrats has his hands on roughly 2 to 4 dozen different media outlets, blogs, and websites, probably this one as well. I wouldn’t be surprised if part of this websites funding comes from Soros, if not directly, maybe from one of his hundred so organizations who financed everything from Ukrainian far-right, to BLM, to leftist publications like Media Matters.